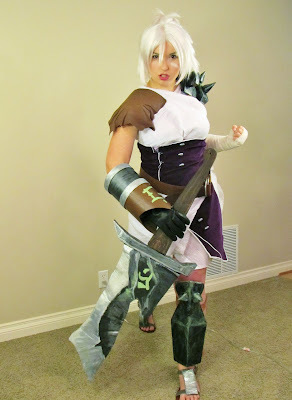 Crafters In Disguise: Riven Costume complete! armor and sword = blue styrofoam insulation, painted with acryllics; the spikes are made of Model Magic (by Crayola). leather pauldron = leather draped over shaped buckram and plastic. shirt & skirt = white cotton gauze fabric from JoAnn's Fabrics. bodice & tabard = purple velveteen fabric, wooden buttons handpainted silver, white trim. sandals: added flashing tape and paint to hide the sequins. glove: from my closet, originally from Army surplus (borrowed from my Cobra Trooper costume). wig: Anime wig from Party Supply store. I need to fix this thing up so I can wear it to PAX later this year.